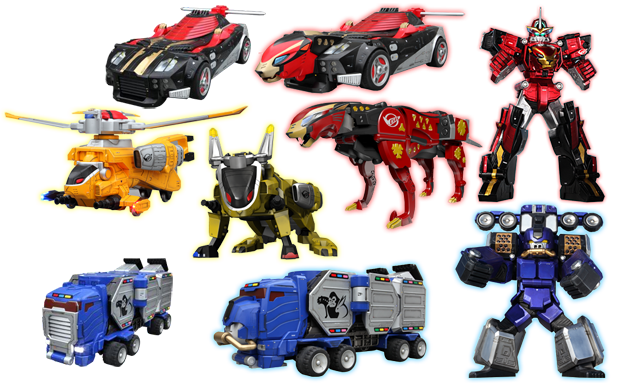 The Beast Bots enter and Link with the Zords and function as the control consoles. Linking with a Zord also slightly increases the Zord’s power level. The Beast Bots can control their Zord on their own without a pilot. Info: Red Ranger uses the Cheetah Beast Blaster for interfacing with his Zord to hyper-charge its “Racer Zord, Cheetah Strike!” finisher attack. Info: “Beast-X Megazord Unleashed!” The Beast-X Megazord is formed by typing B X M Z into the keypad of each individual zord. When combining the Zords in battle, the Rangers activate a surrounding energy shield which protects them from attacks during the process. The Beast-X Megazord is able to shoot blue energy waves that form an energy bubble around the target(s), trapping them inside before using the “Beast-X Hyperstrike” slash finisher.